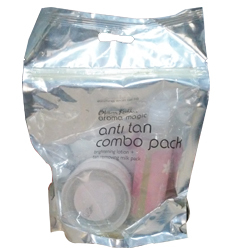 Buy Aroma Magic Anti Tan Combo Pack - Brightening Lotion + Tan Removing Milk Pack - Lightens & Nourishes Skin. The combination of Brightening Lotion and Tan Removing Milk Pack exfoliates your skin and helps to treat sunburns while lightening your complexion. Together they repair the skin cells, leaving it well moisturised, soothed and luminous. Directions for use of Aroma Magic Anti Tan Combo Pack. Mix the contents of one sachet of Tan Removing Milk Pack with the required amount of Brightening Lotion to make a paste. Apply an even layer on the face and neck, and leave it on for 15-20 minutes. Wipe or rinse off gently with water. For best results, use twice a week.